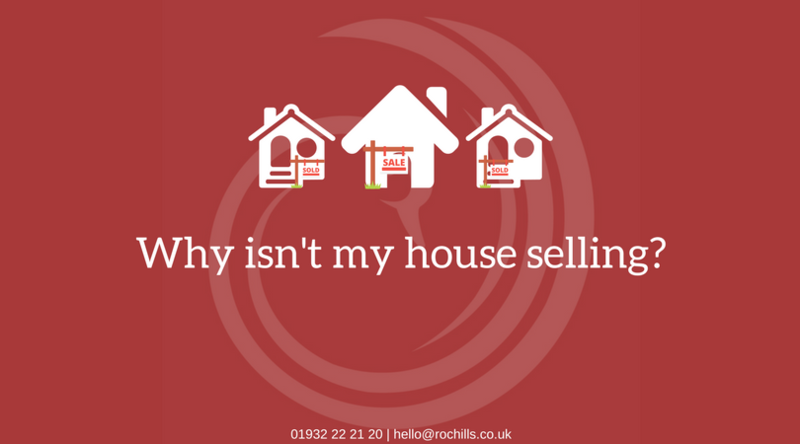 There are a number of reasons why your house is not selling. Often the main issue is that the property has been poorly marketed. this means both in setting the correct marketing price and the presentation. Selling a home can be tricky at the best of times, and despite the general consensus that a lack of housing supply is the main cause of today’s housing crisis, it doesn’t necessarily mean all houses sell easily. If you have had problems finding a buyer for your house then take time to consider the following factors and their possible remedies or call Rochills for advice. Many homeowners end up feeling that their estate agent is not doing enough to sell their home. If you believe that to be the case then make sure you have told your agent that. Ask what else they could be doing to market your property. It’s important to have regular conversations. They should be in touch with feedback on viewings and progress. If not, get on to them. It’s important that they re-assure you that they are doing all they can to actively market your property. Ask the Estate agent about their marketing strategy. Ask them about the current market conditions. Perhaps the price set is too high ? or the agent is not selling the features or missing opportunities . Buyers make up their minds about a house within minutes and if the outside of your home isn’t looking its best you could be losing out on potential buyers. Try to look at your property from the point of view of a prospective buyer – everyone wants a home they can be proud of. First impressions are so important so make sure that the garden is tidy, wheelie-bins are in a side passage if possible, or somewhere where they are not jarringly obvious, and make the effort to clean doors and windows. Once you’ve got a potential buyer through the front door, you need to avoid anything in your control that could put them off. Hide away your unsightly nic-nacs and clear surfaces. Make sure your home is clean, tidy – and ideally pet and child free. We know children and pets are usually something you want to showcase but they can be off-putting for potential buyers trying to picture themselves living in your home. Try to minimise the noise and space they take up by confining them to one area – it’s what TV rooms and gardens were made for! A lick of paint here and there can work wonders – but always ask your estate agent to give improvement advice to avoid investing time and money on the wrong thing. Most buyers will start their property search online so the first glimpse they’ll get of your home will be via photos. Given the wealth of choice offered by most property websites it is easy for people to pass over pictures which look unattractive or don’t have the ‘wow’ factor. Some estate agents use professional photographers while others have been taking photos so long they know what items of furniture to shift and when the wide angle lens is needed. But some agents will be better than others. If you’re photos don’t come up to scratch you shouldn’t accept them. You are after all paying the agent to provide these as part of their marketing services. Ask to approve any pictures before they are posted online. Getting the price of a property right can make all the difference to the prospects of a sale. The best way to ensure you have the asking price right is by combining online research with advice from at least three estate agents. Bear in mind that some agents will overestimate the initial value of a property as a means of incentivising prospective clients whilst other agents may price your house low for a quick sale so they can earn their commission quickly. It’s important to find the right agent. Rightmove, OnTheMarket , Zoopla and the rest: Which portal is best? If you need more reassurance it may also be worth doing some investigative work. Try asking a friend or family member to pose as a prospective buyer in order to gauge the level of service that they receive and to confirm that the person that manages the viewings is knowledgeable and competent. It’s important to be open with your estate agent about your expectations. They should be in touch with feedback on viewings and progress. If they’re not, get on to them. If you aren’t being listened to or have lost faith, give notice to terminate your estate agent contracts and move to another estate agent. But be warned! Terminating a contract with an estate agent is not always straightforward, with clauses that often give agents ongoing claims for commission. What are my options if I just want a quick sale? How long is too long when selling a house? If you were hoping your property would be snapped up almost as soon as it hit the market anything more than a few days may seem too long to you! But according to the experts two months is about as long as you should wait before considering lowering the price or switching agent.